Few, even among Chicago Bears fans, can deny Vince Lombardi is one of the greatest coaches in football history. He served as head coach of the Green Bay Packers for eight years, and single-handedly changed the game for Wisconsin's favorite pro football team. His impact is still felt today. Since Sunset Hill Stoneware is less than an hour's drive from Green Bay, we have a special relationship with the Packers Pro Shop, found in the shadow of Lambeau Field. 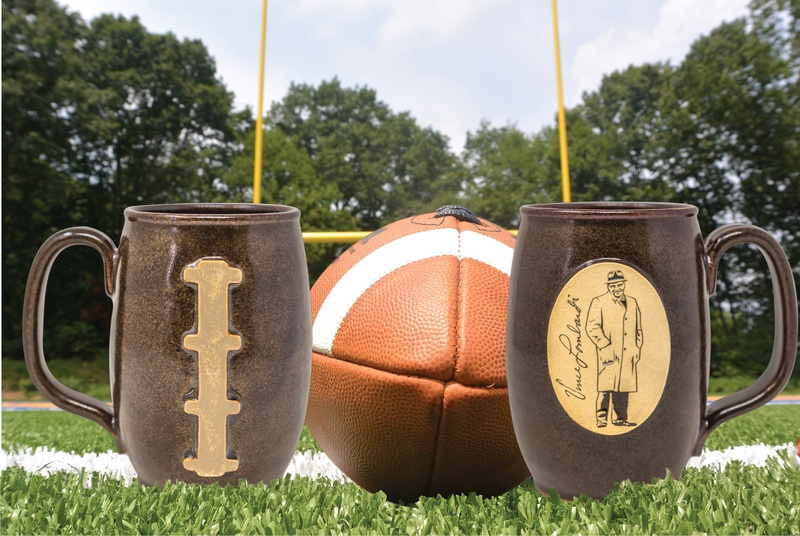 With football season just around the corner, Sunset Hill Stoneware's years-long history with Vince Lombardi and Packer Nation is fresh in our minds. 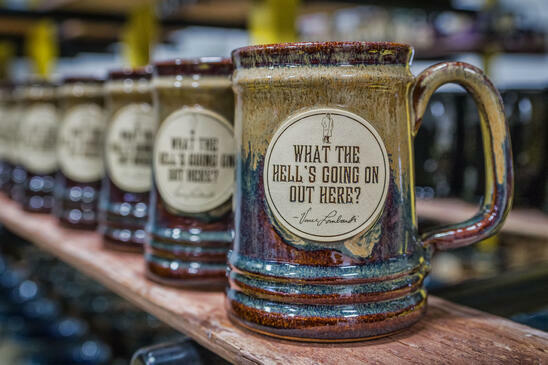 Today, we're one of the only potteries in America that works with the Lombardi family to highlight his quotes and legacy on our stoneware, including a mug available in our online store. 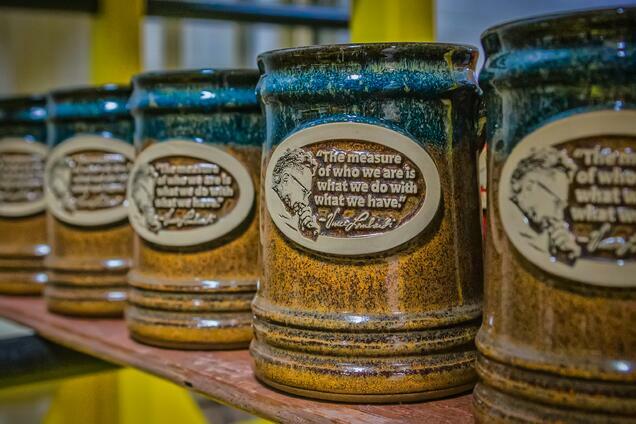 Here's a look at the top 4 Vince Lombardi quotes that appear on Sunset Hill Stoneware products, plus a glimpse into the life of the man himself. 1. "The man on top of the mountain didn't fall there." These famous words have appeared on many a motivational poster since Lombardi stated them during his career with the Packers. They echo the humble beginnings with which the Packers started under their now-legendary head coach. Lombardi came to Green Bay after one of the worst years in Packers history, when the team finished the 1958 season with a dismal 1-10-1 record that left them in despair and demoralized local football fans. The fate of the franchise, and perhaps even the National Football League, was called into question after the onslaught of losses. Upon hire, Lombardi established grueling training regimens for his entire team. The results were immediate. During the 1959 season a year later, the Packers improved their record to a winning 7-5, and in turn Lombardi was named Coach of the Year as a rookie. Few quotes better highlight Lombardi's personality and work ethic as a coach than this. He expected no less than absolute dedication from his players. While his training regimens were particularly intense for the league even at the time, they helped shape the team and ultimately led to the Packers becoming a football dynasty during the 1960s. 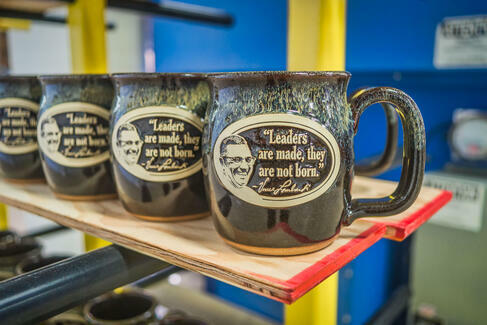 This and other famous Lombardi quotes have graced our promotional coffee mugs for several years, previously including our Straight Shot mug in Hunter Green. 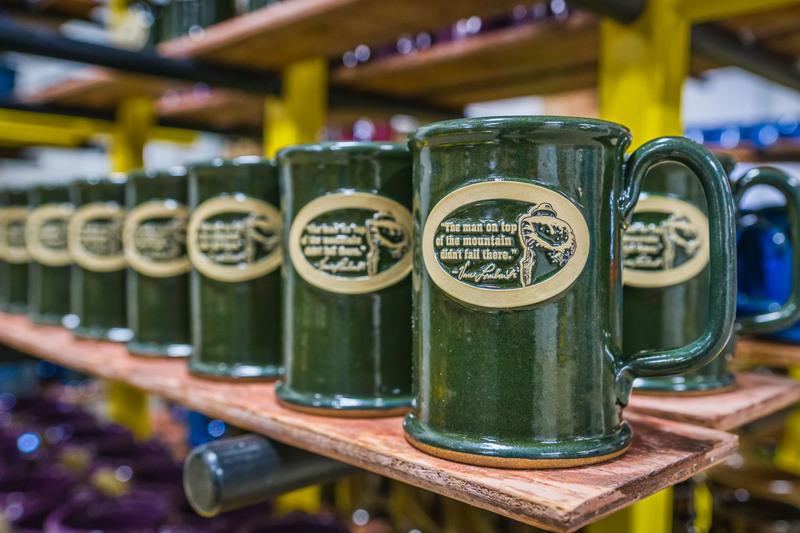 A visit to the Packers Pro Shop in the shadow of Lambeau Field could help you find this inspirational phrase in other colors and styles of stoneware as well, including the Double Barrel stein in Copperhead Run. 2. "Leaders are made, they are not born." Lombardi was the eldest son of Italian-Americans who settled in Brooklyn. He spent his early teen years training to be a priest at a preparatory seminary, only to end his parochial pursuits and play football at an area high school a few years later. Lombardi's youth shaped the type of coach he would become. Discrimination against Italian-Americans was particularly rampant during the 1920s and 1930s, and he and his siblings personally faced prejudice outside their neighborhood in Brooklyn. Due in part to his experiences, Lombardi was a very progressive figure in the NFL during his decade with the Packers. He coached one of the first integrated teams in the league and set rules that no Packers player should give business to any Green Bay establishments that did not treat both black and white players equally well. Lombardi's experiences also shaped his coaching style. He always put effort before talent and developed plays that were unheard of at the time, and that influence marked a turning point for the Packers that still impacts the organization today. This inspirational and storied quote can be found in the Packers Pro Shop online today and in the shop just steps away from Lambeau Field on our mugs and steins. One of the styles it graces is our Java Taster in Caffè Mocha, an online exclusive, where it adds an extra kick of inspiration to your morning cup of coffee. 3. "The dictionary is the only place that success comes before work." There's a reason they named the trophies given to the Super Bowl winners after him. Lombardi was known for valuing hard work and its influence on results, and this value reflects in the Packers losing only one championship game during his tenure as their head coach. During that sole NFL championship game in 1960, the Packers were stopped just yards from the goal line on a play that would have won them the game. It was Lombardi's first and last championship game loss. After that game, Lombardi vowed to his players that they would never lose another championship. His intense training techniques followed into subsequent seasons, and Lombardi promised to consider it a personal affront and seek retribution if his offensive line failed to score a touchdown or field goal from one yard out. The Packers subsequently won the NFL championship game for two consecutive years and went on to win the first two Super Bowl games in 1966 and 1967. We have scores of mugs that have been paired with this advice since we've started working with the Packers Pro Shop five years ago. One of the current styles we have available with this quote is our Java Taster in our Sandstorm glaze, but you may find others at the shop with this quote and Lombardi's bust as well. 4. "What the hell's going on out here?!" Most of all, Lombardi had one of the most memorable personalities in the game. He was famous for shouting to his players in a thick Brooklyn accent and wearing a trench coat during cold-weather games. Whether he was heckling the refs for a bad call or reprimanding his team when things started to go wrong—as with the quote above—Lombardi wore this no-nonsense attitude on his sleeve. Today, Lombardi's look and intense ways of expressing himself are part of his legacy. Few coaches today are seen talking to their players around a hot mic like he did. While plenty of armchair quarterbacks like to debate over whether football has gotten too soft since his era, there's definitely never been another coach like him in more than 50 years of the game. The latest mug and stein styles can always be found in the Packers Pro Shop in Green Bay or on their webstore. 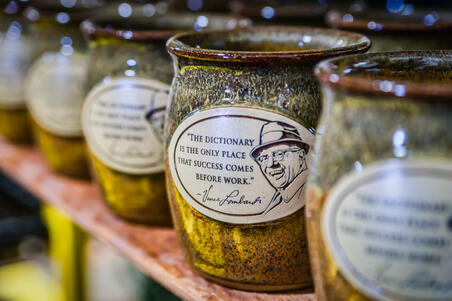 True cheeseheads know Lombardi's words of wisdom, but those who bleed green and gold also have them immortalized on stoneware that was made just a few miles down the road from Titletown. To get an exclusive, football-shaped coffee mug with Vince Lombardi on the medallion, follow the link below.